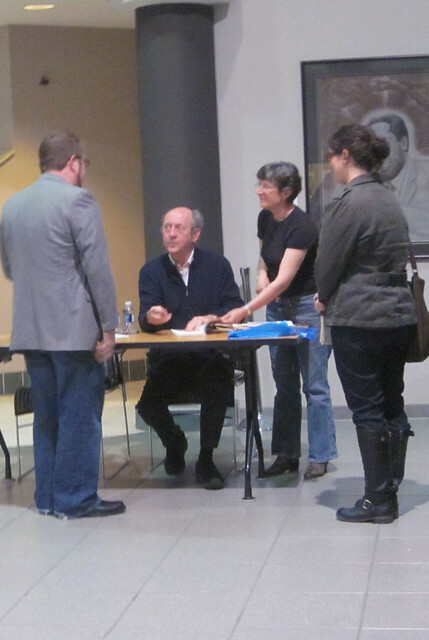 In honor of National Poetry Month, a nearby library invited poet laureate Billy Collins to come and speak at the local community college. It completely astounded me that, in what I am sure is the busiest month of the year for Mr. Collins, he came and spoke at a community college. I would imagine a large university like the University of Michigan or Michigan State would invite and host such an esteemed literary icon. To me he is the Robert Frost of our generation. You don't get more esteemed than that when it comes to poetry. Ever since I read my very first Billy Collins poem, "Introduction to Poetry", I have always had an affection for his poems. He writes in such an accessible way that even the most dubious of poetry readers can't help but find something to like about his style of writing. He has a perfect verbal cadence and always knows how to end his poems on the perfect note. Hearing him read his own poems last night in that perfect cadence just underscored what an amazing gift he truly has. Collins approaches his poems with such lighthearted humor, and yet, they still manage to somehow be incredibly profound. 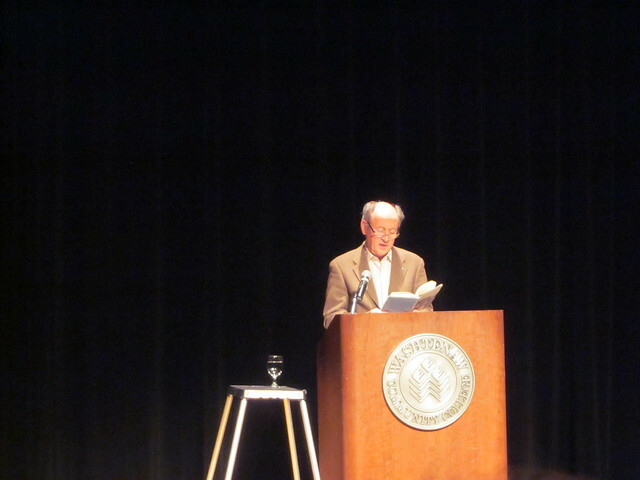 Last night his poetry readings were received with much laughter dotted with an occasional contented sigh or thoughtful "Hmmm..." as the audience contemplated the poem's profundity. During the Q & A portion of the evening, someone asked Collins what he thought made his poems so accessible to people, and I thought his response was really profound. 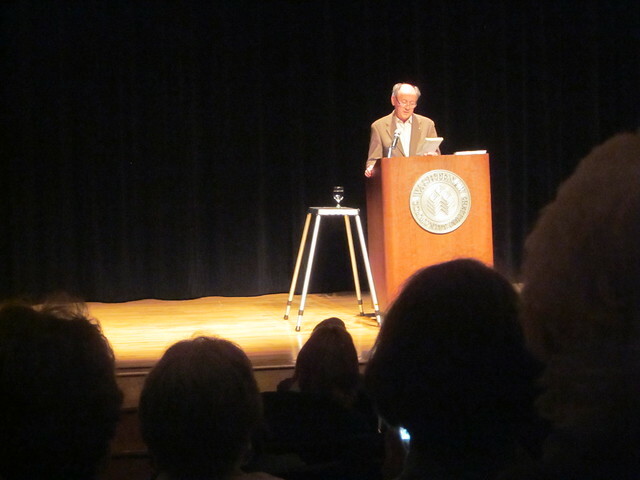 He said (and I'm paraphrasing here) that you have to begin the poem in Kansas where the reader is. If you start it in Oz, where you (the writer) are, then you've already lost them. So his secret to accessibility is always getting the reader up to speed before moving on to the deep stuff. A perfect example of this is a poem Collins read last night. It immediately lets the reader in the writer's mind with a simple title: "Hangover". Without that single word, the poem loses a great deal of its meaning, for the reader anyway. As you read the poem (or listen as was the case last night), you suddenly feel like you're in on the joke because you know exactly what this poem's about. 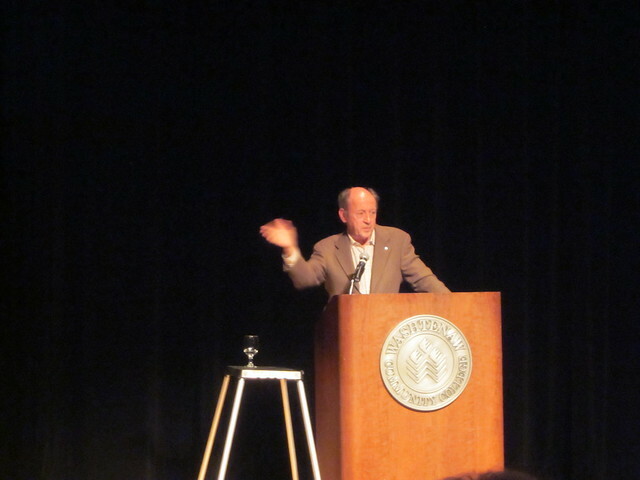 Overall, it was an amazing evening of poetry and I feel that much more worldly and literary to say, "Why yes, one evening during National Poetry Month I went to see poet laureate Billy Collins speak and recite poetry. You do know that he's this generation's Robert Frost, right? 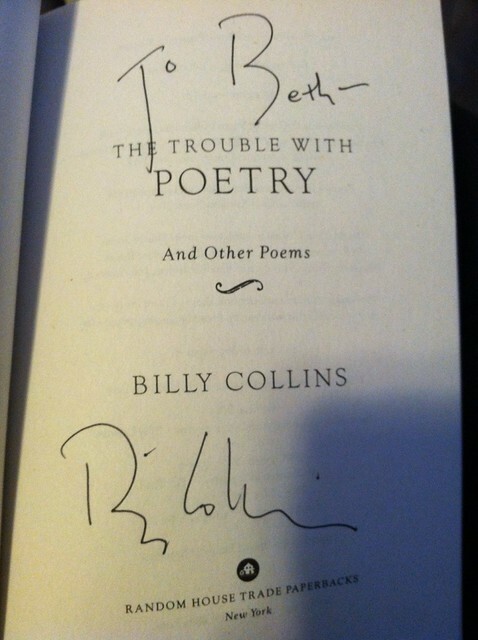 Oh yeah, and he signed these books for me." How incredible that you got to see him speak and to meet him! 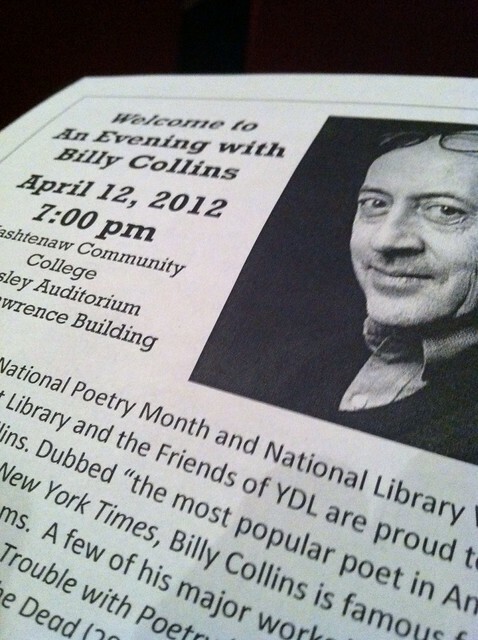 I love Billy Collins and his poetry. I know his work sometimes gets a bad rap from some people, but the accessibility is what I like about it so much.